The Canadian independent film, The Trotsky, is a very charming comedic twist on the stereotypical coming-of-age, teenage high school film with a lot of histrionics and flare thrown in for good measure. Writer/director Jacob Tierney admirably constructs a compelling narrative but lacks the extra structural discipline needed to really make the film propel or soar into more ambitious fare like Rushmore, which the film is very reminiscent of. 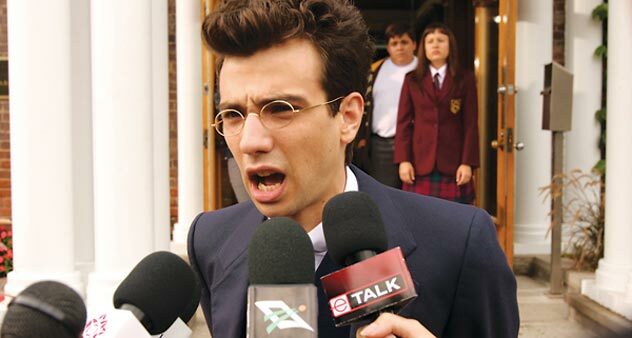 Grade 12 student Leon Bronstein, played by Jay Baruchel (Tropic Thunder), believes he is the reincarnation of the Soviet leader Leon Trotsky and is destined to relive and reenact his entire life in the present. This is much to the annoyance of Leon's father who he is constantly at odds with. Leon enters a Montreal public school and tries to unionize the apathetic student body and improve school conditions. The first act does a good job introducing the premise without dwelling on it and how ridiculous Leon is and how everyone in his life, besides his father, essentially encourages his crazy behaviour. Despite its occasional uneven tone, The Trotsky delivers on its limited premise through the sheer breakneck performance by Baruchel and the strong supporting cast. Despite playing ten years younger, Baruchel gives a great turn as the eponymous reincarnation of the Bolshevik revolutionist. He nails the role and balances his nuanced performance never going to far with the gimmick while playing it straight. The supporting cast grounds the film in a fluid nature with Colm Feore, Saul Rubenik, Michael Murphy, Emily Hampshire, and even David Julian Hirsch. The film is dripping with Canadian sentiment from the actors to cultural touchstones and references which occasionally pull away from the plot and comedic pace. The film shows its Canadian nature with references to Margaret Trudeau, eTalk, Ontario and Quebec politics. Despite the film's fluid pace and disciplined comedic structure, it is clear the director had to shed some material from his lengthy script. The first act is consumed with Leon's destructive relationship with his father which goes from cordial to home wrecking in a few scenes then completely disappears once Leon enters public school as he starts his socialist revolution until the redemption at the end. While David Julian Hirsch is fun in his few dinner scenes with the family, he serves absolutely no purpose and is never introduced past the fact that he is Leon's brother. The Trotsky is a well constructed comedic twist on the teen movie genre but the resolution to the main conflict in the third act is never revealed and the film strays from the emotional arc that Leon goes through. There are too many ideas jammed pack into the film that never really tries to be more than a good comedy and certain plot mechanics get muddled. Tierney's focus seemed over ambitious at first as the film slowly simplifies its story as the plot moves forward, but ideas are dropped and the focus shifts. However, The Trotsky remains a very fun, interesting film that succeeds largely on a few really solid performances and no bad ones. The film is particularly enjoyable for those with knowledge of modern Russian history.